After a rather frantic start to the season in terms of birding, things slowed down considerably with the onset of some strong (gale force at times) westerly winds, bringing with them heavy rain at times. The break in this was the 15th, with a lighter southerly wind bringing a few birds in, but otherwise it was a bit of a slog at times. The view west from North Light - as seen in the opening credits of 'Shetland'! Windy weather has created some impressive seas, although the gales and rain of recent days may have also been responsible for the apparent failure of the Peregrine nest. The mini-fall of the 15th brought the first Tree Sparrow of the year (found by Tommy shortly after his arrival back from holiday), along with 12 Chiffchaff, Willow Warbler (to 16th), Blackcap (with another having been seen on 13th), three Swallow, Sand Martin (with another on 16th), 13 Woodpigeon, a flyover Redpoll sp? and light corvid passage that produced 3 Rook and 5 Carrion Crow (with a hybrid Hoody and 2 Jackdaws the following day). 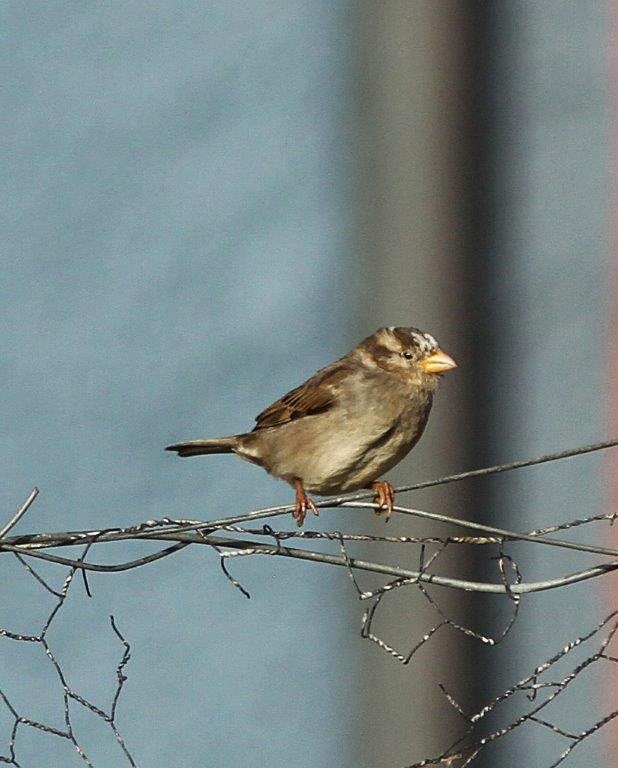 There were also increases in other species that had been lingering, which included counts of 9 Robin, 14 Dunnock, 5 Chaffinch, 20 Snow Bunting and 65 Twite, whilst the Lapland Bunting in Suka Mire may have been the bird seen a few days ago there. Wheatears arrived back with a bang (or a ‘chack’ at least) on 15th, with counts not having not exceeded 13 until then, when numbers leapt to 85. Puffins were also back in numbers and have been coming ashore at their regular haunts – it’s good to have them back and Grace and I will no doubt be out one evening soon to chat to them on Roskillie! 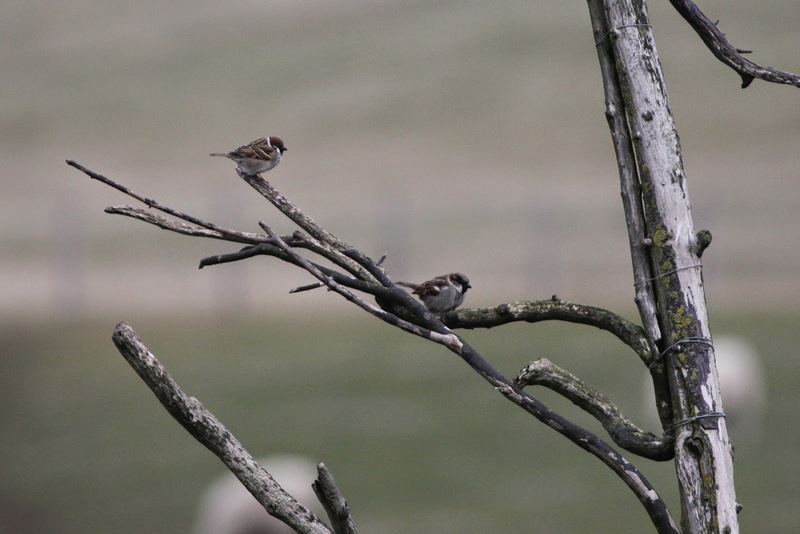 Tree Sparrow (left) at the Haa. The Haa sparrow flock also contains a white-tailed male House Sparrow and this rather odd individual (photo: Deryk Shaw). 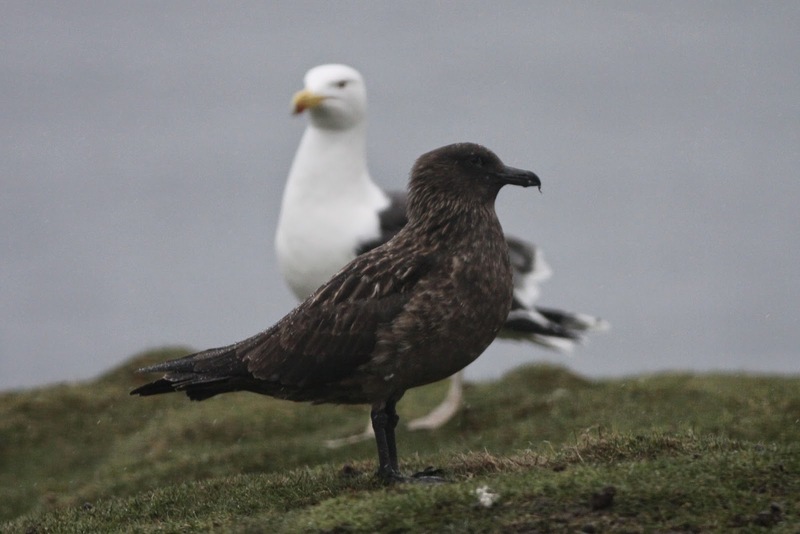 Other sightings of note during the last few days included the first two Whimbrel of the year (in Gilsetter on 14th), Jack Snipe (13th), 2 White Wagtail (14th-15th), Linnet (13th-15th), 2 Merlin (16th) and the lingering Kumlien’s Gull (to 16th), with an Iceland Gull as well on 13th and the general increase in the summering residents included a peak of 287 Meadow Pipits on 16th. Interesting wildfowl were represented by Shelduck (12th), Long-tailed Duck and Goldeneye (both 14th), whilst a Cormorant offshore on 16th was the first of the month. Bonxies are back in good numbers now, with this individual joining the gulls outside the Obs squabbling over kitchen scraps. Other interest during the period was provided by ‘Shetland’; as justice caught up with the Fair Isle murderer and we can all sleep easily at night again! Those of you have been to the island will have noticed a few incongruities (the shots of the inside of the Chapel were disappointing as we think ours is much prettier than the one they used, and it was odd to see telephone wires on what was meant to be Fair Isle), but it wasn’t meant to be a documentary and we enjoyed watching it. It was good to see a couple of Fair Islanders (including Alice our childcarer) making it in as background extras as well (I have to say, the fame hasn’t gone to her head though). The good news is that they have commissioned another series, so maybe we’ll see Jimmy and his team here again, I’m sure they’ll be welcome (although they might find the DirectFlight staff having words with them after rather unkindly referring to the ‘death plane’! ).